The myth of originality began a few hundred years ago, reached its climax with the avant-garde movements of the 19th and 20th centuries, and then receded. Today, we are swept up in a new myth of postmodernism, which demands the recognition that we are all just repeating, collaging, altering, or re-mixing. Nothing is original and everything has been done before. Or has it? Has the location and execution of originality altered? Is it still located in the agent? Is each knowledge maker a unique collagist, creating original styles of re-mixing or merely borrowing from a network of relations? Perhaps each formation of knowledge creates a unique iteration of those relations or perhaps it’s glorified plagiarism. As researchers, makers and creators of knowledge with interdisciplinary methods, these questions incite us to inquire about what we are doing and how we are doing it. Are we simply revising, rephrasing and regurgitating the good work that has gone before us, or is the work truly original? Does it matter? 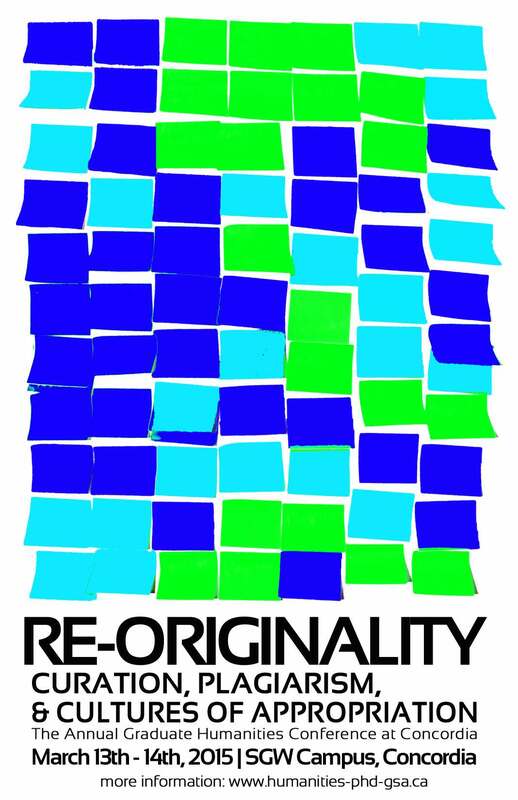 Re-Originality is the theme of Concordia’s 2015 Annual Graduate Humanities Conference and a call to reflect on the ways in which we create and position our work. The conference theme is supported by a reimagining of the traditional conference format with participatory mixers, keynote speakers with a twist and performative soirees. Please send a 300 word abstract (English or French), CV and brief biographical note, including contact and institutional affiliation to humanities.phd@gmail.com no later than Friday, January 16th, 2015. Successful submissions will be notified on January 30th, 2015. In addition to traditional 15-minute paper presentations, our theme is supported by a reimagining of the normative conference format by also inviting proposals for innovative forms of knowledge sharing such as immersive and interactive workshops, performative or demonstrative presentations, installations and exhibitions, and ‘lightning round’ presentations (5 minutes, 5 slides). Please indicate your preference for one or two of these presentation formats in your submission. If you are interested in presenting a performative demonstration or workshop, please include a paragraph or two about how you envision that working (space, time, logistics, tech needs, etc). Le mythe autour de l’originalité a pris forme il y a plusieurs centaines d’années pour atteindre son apogée aux XIXe et XXe siècles avec les mouvements avant-gardistes, et ensuite s’est estompé. Aujourd’hui, nous sommes sous l’emprise d’un nouveau mythe du postmodernisme qui exige d’admettre la répétition, le collage, l’altération ou le mélange inévitable de nos créations. Plus rien n’est original et tout a été fait précédemment. Ou est-ce vraiment le cas? Le lieu et l’exécution de l’originalité ont-ils été altérés? Est-elle toujours localisée dans l’agent? Chaque créateur/trice de connaissances n’est-il en fait qu’un collagiste singulier, créateur de styles originaux de remixage ou ne faisant qui puiser à même un réseau de relations? Chaque formation de savoir crée sans doute une itération unique de ces relations, ou peut-être son plagiat glorifié. En tant que chercheurs/eures et créateurs/trices de savoir fondant nos méthodologies sur l’interdisciplinarité, ces questions nous incitent à nous questionner sur ce que nous faisons et sur notre manière de faire. Révisons-nous, reformulons-nous et régurgitons-nous tout simplement le travail de qualité qui a été fait avant nous, ou ce travail est-il réellement original? Cela importe-t-il? La Re-originalité est le thème du Colloque annuel 2015 des étudiants en études supérieures des sciences humaines de Concordia, ainsi qu’un appel afin de réfléchir sur les manières dont nous créons et positionnons notre travail. Le thème de la conférence s’étend au-delà des présentations en réimaginant le format traditionnel des conférences académiques, y mélangeant un éventail de contributions participatives, d’hardis conférenciers et une touche de soirées performatives. En plus des présentations traditionnelles de recherche de 15 minutes, notre thème vise à réimaginer le format normatif des conférences en invitant les candidats à soumettre d’autres formes innovatrices de présentation et de partage de connaissances, telles que des ateliers immersifs et interactifs, des présentations performatives ou démonstratives, des installations et expositions d’œuvres, et des “présentations éclair” (5 minutes, 5 diapositives). Veuillez indiquer votre préférence pour un ou deux de ces formats de présentation. Si vous êtes intéressé/e à présenter une démonstration performative ou un atelier, veuillez inclure un paragraphe ou deux sur la façon dont vous songez diriger cette activité (espace, durée, logistique, besoins en matériel technologique, etc.). RESEARCHERS DEAL WITH INSTITUTIONS on a daily basis, and despite or because of various bureaucracies, the institution is often taken as given. But what of this often silent infrastructure which frames our activity, ideas and intellectual work, making demands of innovation and originality? While Foucault notes that institutions freeze relations of power, Merleau-Ponty views ‘institution’ dynamically, as a creative force that brings about life. In either conception, institutions are powerful actors. While the word’s Latin root, statuo, gives rise to a number of English possibilities, institution and instituting encapsulate these different registers of noun and verb, static and dynamic, being and becoming. This annual Graduate conference takes up the question of critical institution, asking how researchers see themselves and their work in relation to these processes of power and control. How is knowledge constituted and instituted? Philosophy and theory can imbue the institution with life, vitally mediating subjectivity and nature. For Merleau-Ponty, the event of institution implies duration and “the demand of a future.” Knowledge and creation are instituted through a process of investigation, repetition, search and re-search. Within the arts, as Andrea Fraser notes, historical practices of “institutional critique,” today, seem institutionalized—staid and uncontroversial. Should cultural workers instead, as Irit Rogoff states, “occupy and inhabit [institutions], in ways that can be interesting, critical and inventive?” Or, is it productive, following Fraser, to shift focus to the “institution of critique,” examining “critical claims of legitimizing discourses”? Such a shift may be imperative for practices of research-creation. These trajectories are already asserted in similar threads of inquiry within activist, queer and feminist histories, posing critical challenges to organizational, social and cultural institutions. Can positing alternate models for new institutions and micro-institutions affect relevant social change? What can an examination of such institutions tell us about power relations in general or academia in particular? We invite abstracts of 300 words or less in English and French, plus a 100 word biography. For more detailed information, you may download the full PDF Call for Papers here. The deadline for submission is Friday, February 21, 2014 at midnight. Applications can be sent to humanities.phd@gmail.com or through our Submissions Form.